This was too funny to let go unnoticed: [WayBack] How to turn on the light at home, Philips Version – Kristian Köhntopp – Google+. 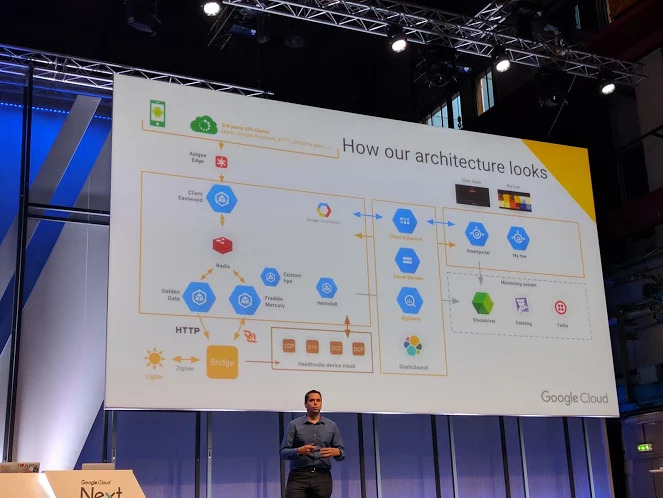 It was shown during [Archive.is] Google Cloud Next 2017 in Amsterdam and immediately reminded me of The Big Bang Theory – How to turn on a lamp below. Wie viele Server braucht man bei Philips, um eine Glühbirne zu wechseln? Apple macht das wohl ähnlich, hier dient ein AppleTV oder ein iPad als “Bridge zur Bridge”. They’re at least honest — the icon of the cloud in the upper left prominently displays a “waiting” circle animation. I also notice the use of the word “looks” rather than “works” in the title, which is probably also accurate. This entry was posted on 2017/06/23 at 23:00	and is filed under Cloud, Fun, Infrastructure, IoT Internet of Things, Network-and-equipment, Power User. You can follow any responses to this entry through the RSS 2.0 feed. You can leave a response, or trackback from your own site.